good feeling, homey. i like the late night gatherings in the food area, makes it look like a modern inn for intergalactic peasants, going to colect their harvest from different planets. locker s they dont have, but i say it s a must. The reception staff are great, more friendly than most hostels I've stayed in. So I can only say positive things about them. Unfortunately the cleaning team let everyone down; after a night wondering what the horrendous smell in my room was, I sniffed around and discovered a large quantity of rotting food in a cabinet... And the bunk bed was stupidly squeaky. Please hoteliers, don't buy metal bunkbeds. Maintenance is lacking and the kitchen is understaffed at breakfast time - the staff are run ragged. I got the impression that senior management have settled for mediocrity and are not committed to being outstanding. The reception staff are good on the whole. This hostel is good for short stays, but not long stays. 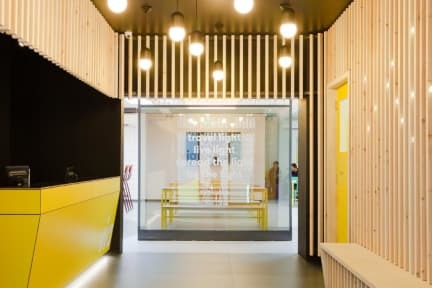 The location is nice and it is close to the main bus line that could get you around London. My main issue was with the bathroom in the 6 person ensuite room. The shower is controlled by a button and the hot water only got up to luke warm, thus a bit frustrating. Also, the lights are motion sensored and would often go off ,thus, I needed to wave my arm out the shower to turn them on. Very dangerous! The staff were nice and accomedating. As 2 females traveling alone, we felt unsafe in this hostel environment as well as the area of which the hostel was located. The hostel rooms were decent for the price we paid per night but I would recommend spending an extra few dollars for safety and to be closer to the city. It is located in not the safest area. As we were checking in a man came up to us and trying to talk to us and got too close, he was on drugs. He then followed us to the train station and verbally harassed us there. The lady working the front desk was very nice and moved me and my friend from a 12 person mixed room to a 4 person room. There is a deposit for locks but you get it back. Lockers are big enough. Bathrooms are bit small I wouldn't recommend just due to the location and safety aspect. It is ok hostel, but we had a bad experience with the staff and the rooms. They had double booked our beds and suddently my friend was told her bed was not hers anymore and someone else was now staying at her bed. They did give us a better room, but it took an hour to fix this situation. Just sort your system out. The pictures of this place paint a very different picture. This place is run down, grubby and is full of long staying guests who have practically moved in. Nothing wrong with that kind of place if it is properly cleaned and the upkeep is taken care of. But this place is none of those. Tourists stay away. 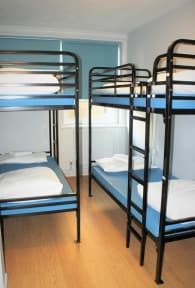 Better hostels for similar price in more central locations, Shoreditch, London Bridge, Kings Cross. Rooms here are also tiny, made worse by people moving everything they own into the rooms. Do not stay here. I chose this hostel because of its proximity to city airport. The beds were unstable, the rooms were dirty, and I couldn’t even use the toilet because of how dirty and smelly it was. Please stay anywhere else.